The Riojasaurus was a prosauropod dinosaur that was in existence in the late Triassic period. 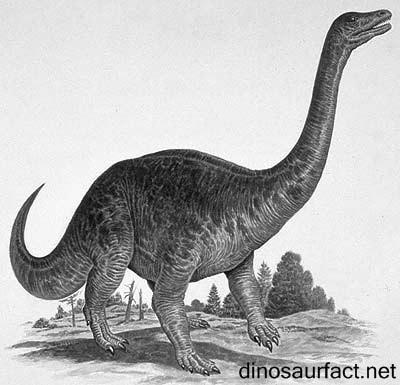 It was of a relatively large size for a prosauropod, growing to about 30 to 35 feet in length. Its height was about 8 to 10 feet. The Riojasaurus was present on the earth about 215 to 210 million years ago. Its fossils were discovered in South America. Many scientists believe that it was related to the African dinosaur the Melanosaurus which is thought to have been in existence a few million years after the Riojasaurus. The feeding habits of the Riojasaurus were herbivorous. Unlike other prosauropods, it could not support itself on its hind feet. It was most likely an obligate quadruped. These were features that were seen very prominently amongst the huge sauropods of the Jurassic period. The Riojasaurus is named after the location in which its fossils were unearthed, the La Rioja Province situated in Argentina. The word the suffix '-saurus' is derived from the Latin word 'sauros' which translates to 'lizard'. Thus the name 'riojasaurus' indicates 'the lizard of Rioja'. The specific name Riojasaurus incertus indicates 'uncertain' in Latin. The specimens were named so as many characters about the dinosaur were ambiguous at that point of time. The remains of the Riojasaurus were found in the Los Colorados Formation in La Esquina, Argentina. They were discovered by paleontologist Jose Bonaparte in 1966. These included almost the entire skeleton, except the skull. The neck vertebrae, fore and hind limb bones, along with sacral vertebrae were very well preserved. In the year 1986, a skull fossil was discovered in the same area in the Los Colorado Formation. Thus was attributed to the Riojasaurus. The specimen was of a relatively small size, indicating that it could have belonged to a juvenile. The Riojasaurus is classified suborder ‘sauropodomorpha’ due to its typical sauropod legs and other skeletal characters. 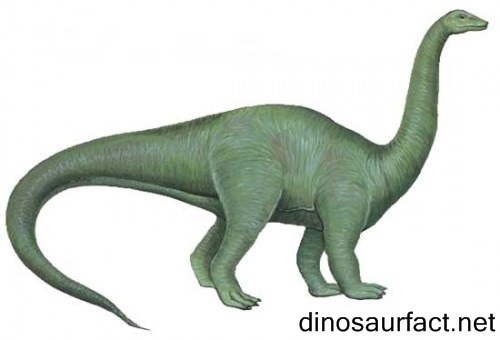 It is considered to be a prosauropod due to the timeline of its existence. Also, its remains have features which do not resemble those of true sauropods. The fossils of the Riojasaurus are amongst the very few prosauropods discovered in South America. They resemble those of the Melanosaurus very closely. The remains of the Melanosaurus were discovered in the Elliot Formation in southern Africa. But Africa and South America was a single continent ‘Gondwana’ in the Triassic period. Thus, the two dinosaurs could have been related or even partially coexisted. The Los Colorados Formation is a natural geological structure located in western Argentina. It comprises of sedimentary rocks deposited primarily in the Norian age of the Triassic period. The flora and fauna of the Los Colorados Formation have been crucial in understanding the dynamics of change between the Triassic and the Jurassic period. Some scientists also believe that the fossils in the upper potions of the Los Colorados Formation could belong to the Jurassic period. The Zupaysaurus, Coloradisaurus and Lessemsaurus were the other dinosaur fossils that were discovered in the Los Colorados Formation along with the Riojasaurus. The other remains discovered in the Los Colorados Formation were those of basal archosaurs, crocodilians and also therapids and basal chelonians. Jose F. Bonaparte is paleontologist who has worked extensively with dinosaur fossils in his native country of Argentina. He has discovered innumerable remains of prehistoric organisms during his long, illustrious career. Bonaparte is given majority of the credit to make Argentina the location of prime interest for paleontologists all over the world. Although Bonaparte has not formally studied paleontology, he has been a fossil enthusiast since a very young age. His collection of remains mushroomed tremendously in the years to come and he became a senior scientist at the Bernardino Rivadavia Natural Sciences Museum in Buenos Aires. The fossils studied by Bonaparte include those of the Argentinosaurus, the Argyrosaurus, the Coloradisaurus, the Patagopteryx and many more. The Riojasaurus was a big dinosaur as compared to its contemporaries, weighing as much as 1000 kilos. It grew to about 8 to 10 meters in length from head to tip of tail. The neck of the Riojasaurus was long like those of other prosauropods. Its cervical and other vertebrae were hollow in structure, a character rendering the neck not very strong, but dexterous. Its head was of a small size, as indicated by the fossils discovered in 1986. It is believed by most scientists that the Riojasaurus would not have been able to support a larger head on account of nature of its neck bones. The Riojasaurus had teeth which were serrated and spindle shaped, which indicated that it chewed its food thoroughly before swallowing. The front and hind legs of the Riojasaurus were almost of the same size. Due to this, it could not raise itself on its hind legs to graze on higher vegetation like other prosauropods. Its limbs were strong and substantial, as indicated by the long bones of its legs. Its tail was thick and long, probably used for balancing its body while walking. The Riojasaurus fed on grasses and other vegetation. Although it could not lift itself up to get to its food, its long neck afforded it increased reach. Its gait was probably slow and leisurely due to its size. Also, its extremities were not designed for running. The habitat of the Riojasaurus consisted of grasslands and lightly wooded areas. It found easy nourishment in its environment. The Riojasaurus is considered a relative of the Melanosaurus. Although it is unlikely that they coexisted, they could possibly have a common ancestor. The other dinosaurs found in the Los Colorados formation, namely the Coloradisaurus, the Zupaysaurus and the Lessemsaurus could all have co-inhabited the South American region with the Riojasaurus. A large amount of fossil evidence is presently available about the Riojasaurus. 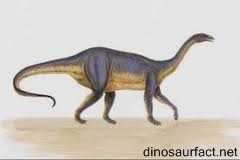 It shows that the Riojasaurus had features resembling both prosauropods and sauropods. This indicates that it may have been and intermediate species between the two classes of dinosaurs. Some scientists believe that prosauropods and sauropods may have had common ancestor, but the importance of the Riojasaurus in understanding the course of evolution between the Triassic and Jurassic periods cannot be denied.